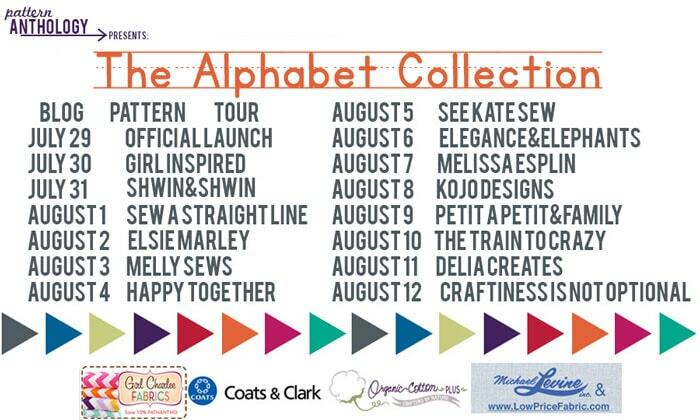 Today is my turn on the Alphabet Collection blog tour, so I’m going to be showing you the pieces I made with more details and on location photos. I love how it looks like the outfit was planned to coordinate with this location (it totally was the other way around). But Tater looks so old! 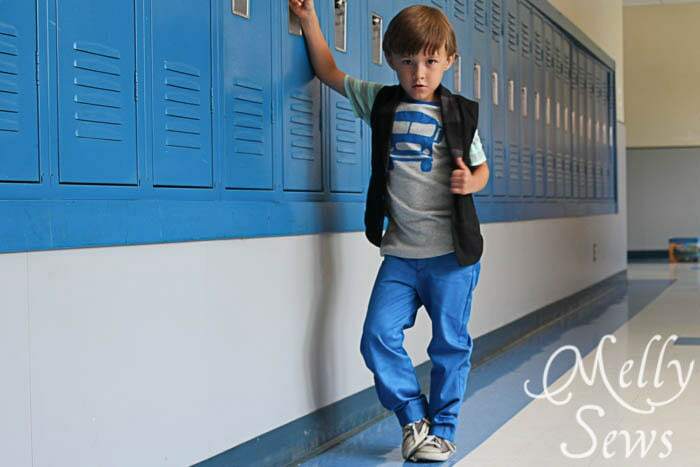 He’s starting kindergarten in a few weeks – where did the time go? I’m also talking about the wonderful collection sponsors – seriously, these are all amazing and I have purchased from all of them besides their sponsored fabric and notions, and will do so again. I can honestly recommend all of them. Let’s start with the Study Hall Jacket, which was designed by GoTo Patterns. Andrea did a great job with this pattern – it has tons of detail you can personalize, but it’s also got clean lines that let printed fabric shine. This one features Echino Bonnetbus fabric from Michael Levine LowPriceFabric.com. They still have some of this in stock, and bonus – it’s on sale! I also think the Airplane print from the same line could look really cools since this is a bomber style jacket. Maybe I need to make one for Bean in that print. I lined the jacket and made the contrasting welt pockets with blue flannel, so this jacket is also pretty warm. Tater was a rock star modeling it in the 100 degree heat we’ve been having. Now let’s talk BBC vest , by Shwin & Shwin. I love Shauna’s style, and this pattern is no different. I made it with black twill from Organic Cotton Plus with a pop of Charisma cotton fabric from Michael Levine LowPriceFabric.com. The Charisma fabric looked like it had gray dots to me when I picked it out late at night, but they’re actually lime green and purple, so a fun little unexpected pop of color. 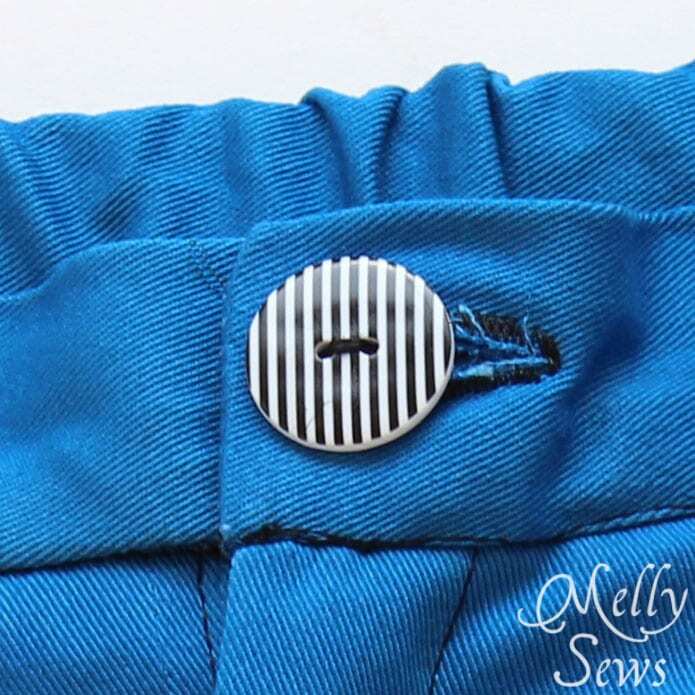 I decided to play that up by adding contrasting buttons as well, to pick up on the blue that appears in every piece I made. 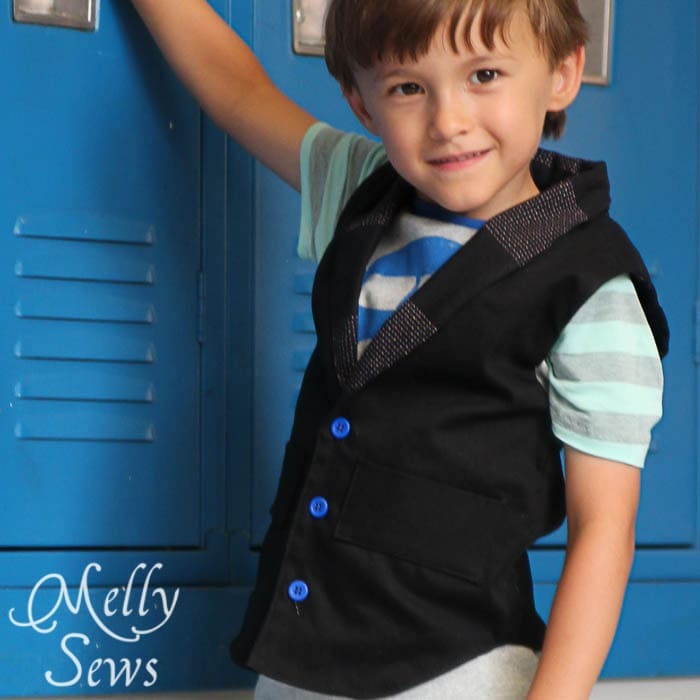 I’m also in love with that curved shirtail hem on the vest. And the shawl collar – swoon. Now let’s talk pants. These are the W pants that I designed. I was inspired by a pair of shorts I saw a guy wearing that had this cool inverted yoke, so I took that inspiration and ran with it. Once again this is twill fabric from Organic Cotton Plus, but this time I ordered white twill and dyed it. The dye color is Royal Blue from Dharma Trading Company. Side note: I also ordered plain natural colored interlock from Organic Cotton Plus with the same plan in mind – I’m going to keep it as a staple to dye. It’s super soft and yummy, and actually I’ve had a hard time finding plain interlock (which I often prefer over jersey, especially for winter) so I see myself ordering this again and again. I added black piping between the yoke and the pants in the back since I decided not to do a contrast yoke, and the added piping to the front pockets to match. I love the way the Coats and Clark zippers pop. These zippers are super awesome by the way – they are the new Pocket Zippers in Aluminum (they also come in a brass color). Details like this are what take clothing from “just handmade” to “awesome bespoke fashion” I think. Another detail I love on the pants – I ordered this button from Michael Levine LowPriceFabric.com and I think the black and white stripes are perfect for this look. I call this picture the “hey, Ladies” picture. Oh my goodness I think I’m going to have trouble on my hands. This kids best friends are all girls. Seriously, where did he get this pose? 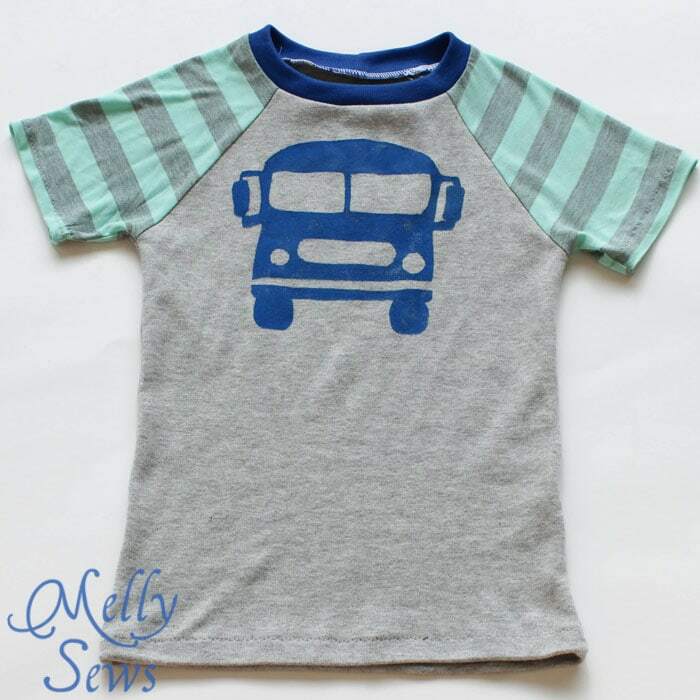 Finally let’s talk Recess Raglan. This is the perfect basic staple by See Kate Sew. I used gray and gray and mint jersey from Girl Charlee to make this. And bonus – I used so little of the gray/mint stripe that I have some I can now use for me! I love the unexpected color on a boy, but I also had to be very careful so the Hubby wouldn’t think it was too girly. So I used just a little and added the school bus freezer paper stencil to tie it in to the rest of the outfit. 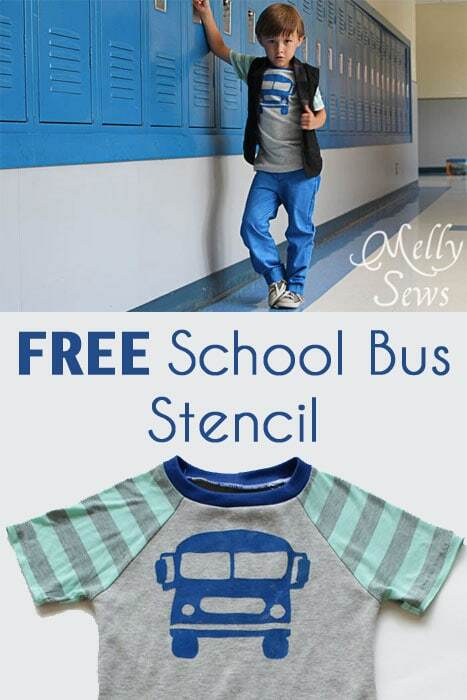 Oh, and by the way, you can download the stencil I made and put a schoolbus on your own Recess Raglan if you want. Get it here. So, whatcha waiting for? If you haven’t bought the Alphabet Collection yet, time’s a wasting. It’s only available until August 12th. And make sure to check out the rest of the blogs on the tour – they have done some AMAZING looks with these patterns! This is adorable! Great job, Melissa! Love the fabric on the jacket and the blue and black pants. He is quite a model! I really love this outfit. Great colors. 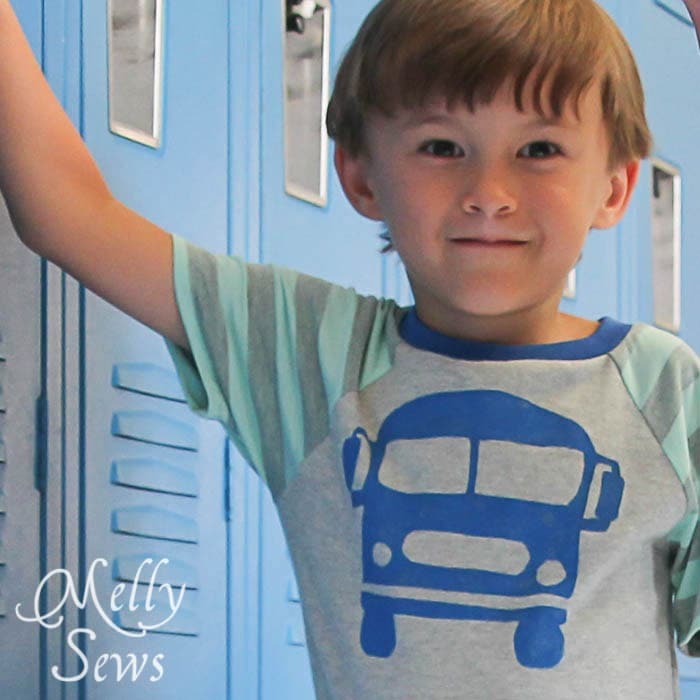 The fabrics are fantastic, especially those busses! Melissa this is too cute! I know I already saw them all but the school pictures?? So cute! He is such a little model! This entire outfit! I can totally see Vincent in this, I absolutely love it! Wow!! This is amazing.. so glad that I came by to take a look. Your stencil is awesome by the way.. I can’t get over how perfectly the lockers match! So cool! That school bus graphic is awesome, I love that you ran that theme from the jacket to the shirt. The pants are so amazing!! You are amazing!! I purchased this pattern yesterday. Could not resist the flexibility and although I have been sewing for my granddaughter who is 2, she has a baby brother on the way and I want to be able to sew for him as well. Boy patterns are not nearly as plentiful but these are all great. Thanks for the inspiration. I just purchased mine today. Excited to give it a try for both my kids. I love the whole outfit. My favorite is the pants. Your black lines line up perfectly and the blue is such a cool color that fits perfectly on very cool pants. What a cool photoshoot and how perfect is the color of those lockers! The blue of your pants is phenomenal, I am going to have to find some of this dye here in Montreal. Everything looks so good, the buses are too cute and so is your son. Thanks for some amazing patterns! You ladies rock!! !